Posted in: Public Outreach. Tagged: exoplanets. We had a brilliant time on Friday, talking about the recent discovery of Proxima Centauri b, even though the clouds prevented us from star-gazing. Lots of great questions from the audience, with some really good ones from the youngest audience members. Thanks to my student volunteers to sticking it out and to KBSX for helping us advertise the event. Most of all, thanks to our wonderful audience for coming. 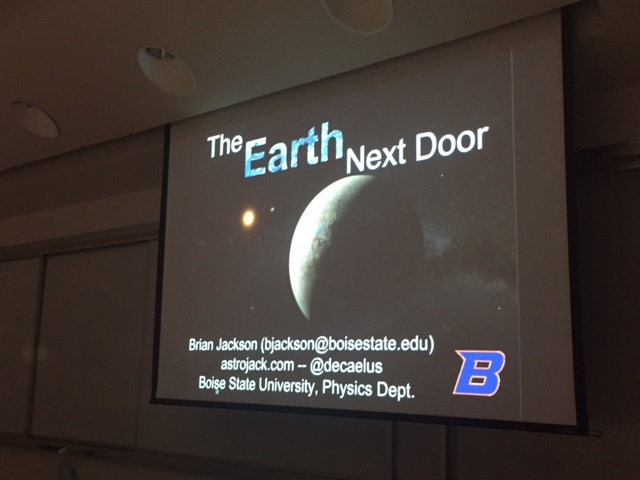 For the rest of the semester, Boise State Physics will host public star-gazing events on the first Friday of every month at 7:30p, so the next one will be on Oct 7. Stay tuned for details!